WEDDINGS. WINERIES. BREWERIES. & SO MUCH MORE. We pick you up at your accommodations and return you afterwards. Leave the driving to us and have a safe fun time. Call For GREAT Monthly Specials on Two or More Persons!! When you hire us for a wine tour, you are the only ones on the trip - it's a private tour just for you and your friends. Call us to customize the perfect package to meet your needs! Our only goal is to make your wine tour the most unforgettable wine tasting tour you've ever been on. 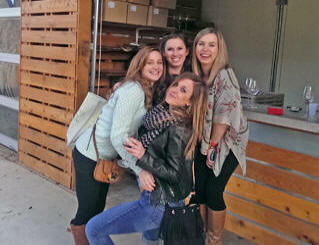 We love to provide custom wine tours. Call us now to discuss the wine tour you have in mind. We specialize in custom tours with custom service from $79-$99 per person on Saturdays. We also have great rates for custom weekday tours. Custom wine tours where you pick the wineries start at $129/person with a five person minimum. Call us for additional information. OTHER POLICIES: The client assumes full financial liability for any damage to the shuttle caused during the duration of the services by them or any members of their party. Sanitation fee is $450.00. Alcohol Consumption is allowed if over 21 years of age. Not responsible for items left behind after services.